Charlie's Laundry Liquid does 32 full size washloads for just pennies per load. 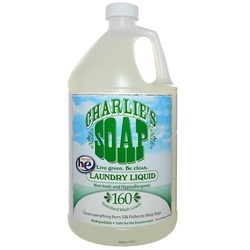 Charlie's Soap rinses completely leaving no residue on your clothes or in your washer. Perfect for babies and those with sensitive skin. Charlie's Soap has no perfumes, no fragrances, no chemical brighteners. HE - front loader compatable. Clean fresh clothing and no oder buildup in your washer. New built in measuring is easy to use.